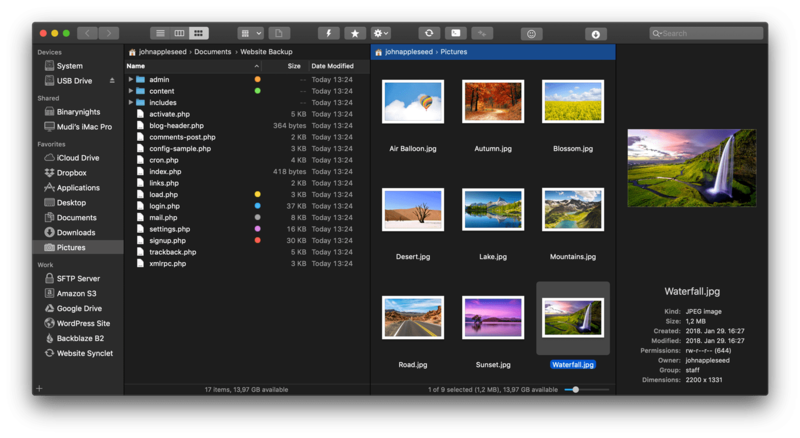 The most advanced dual pane file manager and file transfer client for macOS. Connect to SFTP, FTP, WebDAV, Amazon S3, Backblaze B2, Google Drive, Rackspace CloudFiles, SMB, AFP, and NFS remote volumes and easily manage your files quickly across networks. You can connect to multiple servers at a time and even copy between them with drag and drop. Sits on your menu bar and lets you mount a saved remote connection as disk, upload files to a remote server from Finder by drag and drop, or run a saved Synclet even if ForkLift is not running. Compare local or remote source and target folders identifying matching, modified, new and deleted files. Synchronize them one or two-way with a single mouseclick, or save it as a favorite. If you are a web developer, you'll love this feature. The preview panel shows you useful information about the selected file. It lets you playback audio and video files, inspect images, PDFs, and other popular document types. You can do quick edits on a text file in place, both on local drives and remote servers. Easily access your favorites, devices, menu commands, open a selected file with a desired application, or apply a previously saved Multi Rename preset on selected files or folders. Use the Multi Rename tool when you need to rename a large number of files on your local drives or remote servers. Change case, replace text using regular expressions, add dates or sequences, and combine them in a saved preset. Turn on the stunning dark mode to reduce eye strain and focus on your work without any distraction. The most effective way of file management. Split panes horizonally or vertically, or use a single pane. Keep all your favorites, synclets, and rename presets synchronized across multiple computers via Dropbox. Copying Dropbox links to files located in your Dropbox directory is just a right-click away. Reorder transfers, set conflict management rules, error handling, limit download and upload bandwidth. 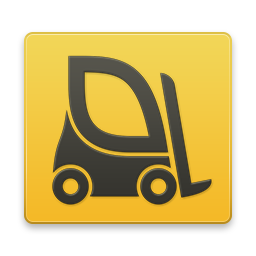 Organize your documents and files with tags: add, edit, remove, search, or filter them within ForkLift. Mount remote servers and make them appear on your desktop as simple local drives. Given two identical folder structures. Browse in one pane and let ForkLift do the job for you in the other pane. You can have different folders opened in the same pane, instead of having separate windows open at once. Search and filter by name, extention, kind, tags, or content to quickly find files, even on remote servers. Select files by typing a filename, an extension, or a tag, and add them or exclude them from the selection. ForkLift comes with an application deleter to remove the last morsels of an application you want to uninstall. Browse local and remote archives as if they were ordinary folders. You can even Quick Look, search and filter. Control every operation straight from the keyboard, including selecting files by pressing the spacebar. ForkLift speaks English, Chinese (Simplified), Czech, French, German, Hungarian, Polish, Russian, Spanish, and Ukrainian. Save different layouts with opened tabs and locations, and load what you need at the moment. FXP Copy lets you transfer data directly between FXP-enabled servers without passing through your Mac. Extend ForkLift's capabilities to the max by invoking command line tools and apply them by using shortcuts. ForkLift knows git and will show you the status of individual files. You can add, commit, push, and pull. An absolute must for powerusers. Open a Terminal, iTerm, Hyper, or Kitty window at your current local path. Make hidden files and folders visible easily by using a shortcut or pressing a button in the toolbar. Share gives you an easy way to share all kinds of documents and other files instantly. 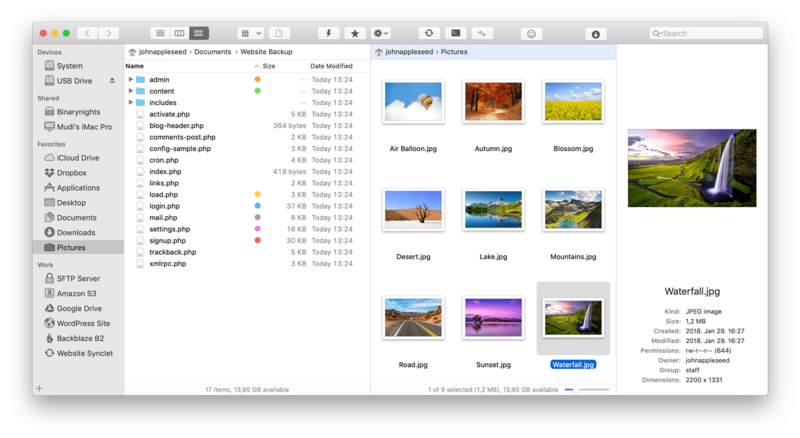 Set ForkLift as the default file viewer, and almost every app will point to ForkLift instead of Finder. Compare two text or images files with Xcode's FileMerge, Kaleiodoscope, Beyond Compare, or Araxis Merge. We never share your email address, your privacy is important to us. Get great power over your files. Thank you for downloading ForkLift 3. Please subscribe to our newsletter if you would like to get updates on our major announcements or discounts. If your download did not start, please click here. Copyright © BinaryNights LLC. All rights reserved.